Building my own map, one trip at a time. I think most of you could have figured that I have been on hiatus without this post. I have been busy working on other parts of my life, so much so, that I have neglected this blog and forgot a bit why I started it in the first place. Not just for the readers… if there are any… but because I wanted to document my travels and have a point of reference many years from now when I’m dreaming about where to return to and where I have been. I promise I will be back. Just hold on a little bit longer while my next adventure falls into place. It will be here before I know it. Until then, a picture from my last adventure in Amsterdam. Maybe when I finally get around to posting I’ll let you know my secret for getting the famous iamsterdam sign all to myself! Colombia…you had me at first flight. It wasn’t even on my radar. I had fallen into the trap of thinking what other people thought. “Colombia is dangerous” and “You cannot travel alone in Colombia without something bad happening”. But then I met other travelers who had started in Colombia. They were in love with it. They had nothing but good things to say. Okay, if one person said it, I would skip but this was literally almost every other person I met had said Colombia was their favorite. It was decided, I’d fly from Lima to Bogota to save time. I landed in Bogota mid-day. Thankfully, by this point in the journey, my Spanish was understandable. I was able to have conversations with almost anyone and the words seemed a bit clearer. I got a cab and headed into town. I chose a brand new hostel and I was literally the only one staying there. It was wonderful and recently opened by a couple from Switzerland. The hostel had a chalet theme and it was by far the best money I spent on a hostel the entire trip. Check out the Arche Noah Guesthouse if you want a great place to stay at a good price. Bogota is a dynamic city. The damage from the drug cartels in the late 80s and early 90s is very evident and it appears to be a city still recovering. I was naiive of the events when I first arrived and just assumed it was like most developing countries. Even though the city doesn’t scream “new” & “cosmopolitan”, it is a wonderful city with much to explore. The first stop when you arrive or shortly after should be Monserrate, a mountain in the middle of Bogota. You can chose to climb the mountain or to take the funicular up. I chose the funicular up and the stairs down. The view from the top is worth it and a great introduction to the city, sprawling across the landscape. View from the top of Montserrate, Bogota. The walk down is something to behold. Lots of little shops set up along the way as you pass hundreds of people going up and down. Now, don’t let me fool you. Going down is not easy. Your legs will be fatigued by the bottom. Just think of it as a great way to get in your daily workout. Once you have taken the city in via nature, your next stop should be the Botero museum in downtown Bogota. If you haven’t heard of the artist Botero, you will shortly after your arrival in Colombia. His influence and works of art can be seen across the country. He also has a very obvious style that once you see, you can almost always recognize. The Botero entrance greets you with a “hello”. I won’t even bother sharing the works of art so you have more of a reason to stop in. The architecture alone is enough to make one want to stop in. And did I mention the best part? It is free. I cannot be the only one who loves a beautiful hallway. What are you waiting for? Did you book your ticket to Colombia yet? Just wandering around Bogota is an adventure. We woke up at 4am. We then waited in line for an hour to get on the bus that would take us up to Machu Picchu. I have never seen so many people wait in a line at that hour of the day. But it was more than worth it. One of the firsts to get there. We were lucky to be some of the first people to enter the park. There was another option to hike up to Machu Picchu but as we had another hike ahead of us, the bus was the best option. We spent the next hour wandering the ruins and listening to the tour guide, me catching every fourth word in Spanish. We had an entrance ticket to Wayna Picchu at 10am. Also known as Huayna Picchu, only 400 total can climb each day, 200 in the morning and 200 in the afternoon. We had the 10am pass so as long as we started our climb before then, we were guaranteed entry. I thought getting the ticket was the hard part but little did I know, I was gearing up for the hardest climb I had encountered yet. Oh, and did I mention I had a backpack with a computer in it? Yea, word of advice, use the lockers outside of Machu Picchu. Unfortunately I didn’t know about them until it was too late. The beginning of the climb.. you have to go down to go up. The next hour would be spent climbing steep stairs with people crossing up and down. It was hard. You stopped asking people how much longer because you truly did not want to know. I was out of shape, but I was even more impressed by some of the people doing the climb who were three times my age. What happens if someone had a heart attack or broke something during this climb? Must think happy thoughts…. Some people brought oxygen along the way. You also forget that you are quite a bit above sea level (7,972′) and simply breathing is a challenge in itself. We had some coca leaves which helped you to keep going when you wanted to quit. All said and done, it was so so worth it. If you take all the time and money to get to Machu Picchu, make sure you plan well enough in advance to climb Huayna Picchu as well. I can’t say enough good things. All I can do is give you a taste of the victory you will feel when you reach the top. Oh yea, you have to hike back down too.. It was exhilarating. It is clear why it is a wonder of the world and why it is on seemingly everyone’s bucket list. I would do it all again in a minute. We were dropped off in the middle of some mountains after 6 hours on minibuses that seemed capable of falling off the side of the cliff. Hydroelectrica. A required stop for anyone trekking to Aguascalientes. We walked across a make-shift bridge that would never fly in the U.S. We then headed into town where the smart people could take a 30 minute train ride into the little town. Ricardo and I decided to hike. After a quick stop at a restroom, we hit the trails. It was only supposed to take around two hours, it probably took us closer to three. You would pass people along the way and ask how far. At a certain point, it just became depressing so we just smiled and walked past. We saw some animals along the way including guinea pigs. Intriguing to see since we knew, by that point, what guinea pig tastes like. It started to get dark and there still wasn’t much sign of the city. There was also a train tunnel that said to not walk through. We didn’t see any other way around though, so we proceeded. It then started to rain and we wondered if we were ever going to make it to the town. We found some other lost souls along the way who didn’t know where to go either. Eventually, we found the city and we made our way into town. Now, at this point, I had gone on a few hikes throughout South America and I had also been more active than I had been in years. What had happened? Why was I so exhausted from a 2 and a half hour hike? Thank goodness we were taking the bus up the mountain tomorrow. We waited for our guide to take us to our hotel for the night. We walked past all the nice hotels to possibly the worst hotel I have ever stayed in. I’m not even sure you can call it a hotel. There was no real water, and of what was there, it was freezing. This was even worse than the hotels we stayed at on the salt flats of Bolivia, at least those felt semi-clean. We only had to be there for a few hours though so we sucked it up and called it a night. All for the sake of adventure. In the morning, Macchu Picchu. After Lima, we headed to Cusco. You cannot talk about Cusco without talking about food. Now, food almost everywhere in Peru is delicious. I am not sure what it is, perhaps it is all the potatoes, but the food is just great. In Cusco, we stayed at two different places. For the first part of the trip, we were at El Mariscal, Cusco. I would definitely recommend this hotel. It is walkable to most areas of the city, feels safe, and great price. We had already booked our tour for Macchu Picchu (which I will discuss in my next post), so we spent our time looking at other tours around Macchu Picchu and exploring Cusco. We were in Cusco for around 8 days which was a good amount considering Macchu Picchu takes up a minimum of two days. Our first day in Cusco was spent adjusting. 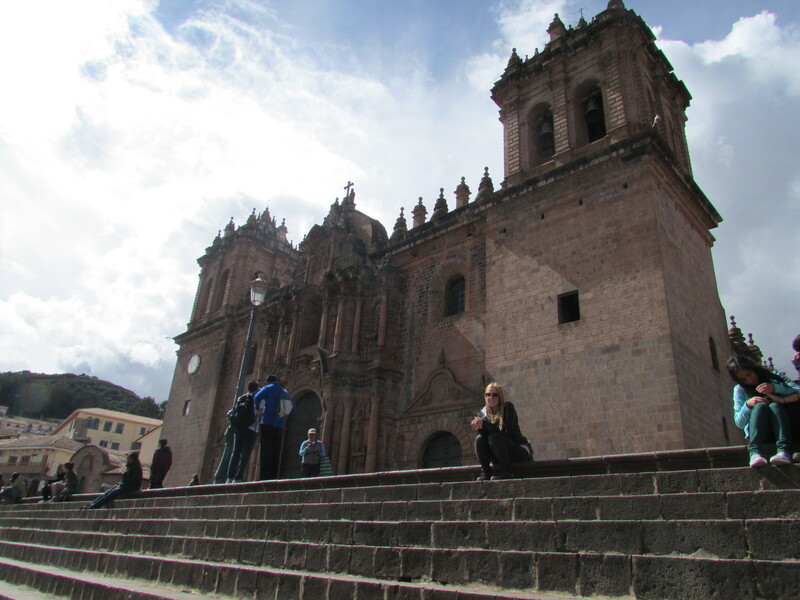 We then signed up for a local tour around to some of the sites in the area surrounding Cusco. If you think Macchu Picchu is all there is to do near Cusco, you are sorely mistaken. 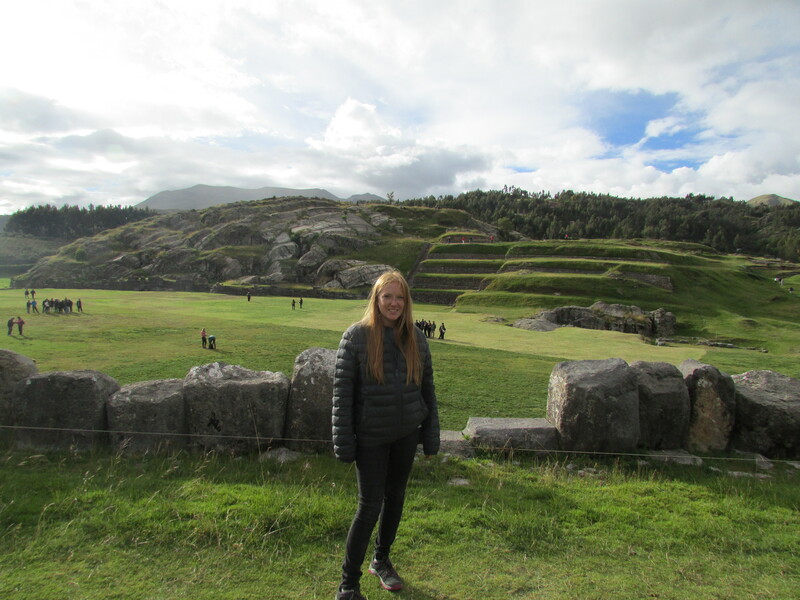 We went on a tour of Sacsayhuaman with a local tour company. They also took us to a few other ruins around the area. It is amazing to see what people built thousands of years ago. This was a tour of an Inca fortress that is situated above Cusco. It is very large and you can spend some time walking around. 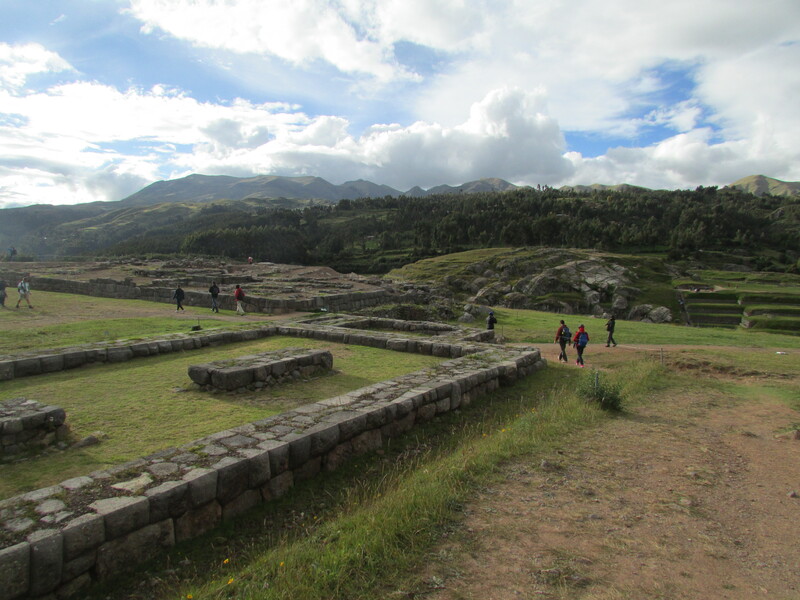 Walking around Sacsayhuaman, just outside of Cusco. The other part of the day was spent touring some museums in the area and even seeing some buildings that date back to the Incas within the city. The buildings themselves are engineering marvels considering the amount of earthquakes they withstood. Some are built better than modern day buildings. Taking in Plaza de Armas from the steps of the Cathedral. Green Point – Go. Now. Do not think about it. Cheap Vegan eats that you cannot beat. Go for lunch and you will not be disappointed. Stop after a meal for dinner. You will not regret it! The amazing dessert at Green Point. Le Soliel- We splurged on this one while we were in Cusco. This is one of the top rated French restaurants in not only Cusco, but all of Peru. You will not be disappointed but it will cost you. We started with Escargo and then I went with the Duck l’Orange and my boyfriend had the rack of Lamb as main courses. All was delicious and prepared very well. We washed it down with a wonderful bottle of Malbec that the owner recommended. World-class experience. Papachos – Right out side of Plaza de Armas is this burger/wings/ sporty restaurant that you take the stairs straight up. You can sit on the balcony and watch the people in Plaza de Armas. The view comes with a price and two burgers and drinks ran us around $40 USD. Try the Alpaca burger or stop in for drinks when your favorite team is playing. You won’t be disappointed. Great, solid food, when you are missing some more typical American style food. After my wonderfully relaxing stint on the North Coast of Peru, the time had finally come to head south to visit Lima and Cusco. I was to meet my boyfriend in Lima in two days time. I hopped on a bus myself for 16 long hours south to Lima (highly recommend Cruz del Sur if you are bussing it around Peru). I thought of stopping along the way but there were no clear stops and it would have ended up costing me a day or two. I could also hear the sound of luxurious, actual hotel rooms calling my name knowing that I’d be able to split the costs with someone. Miraflores, the place to be in Lima. 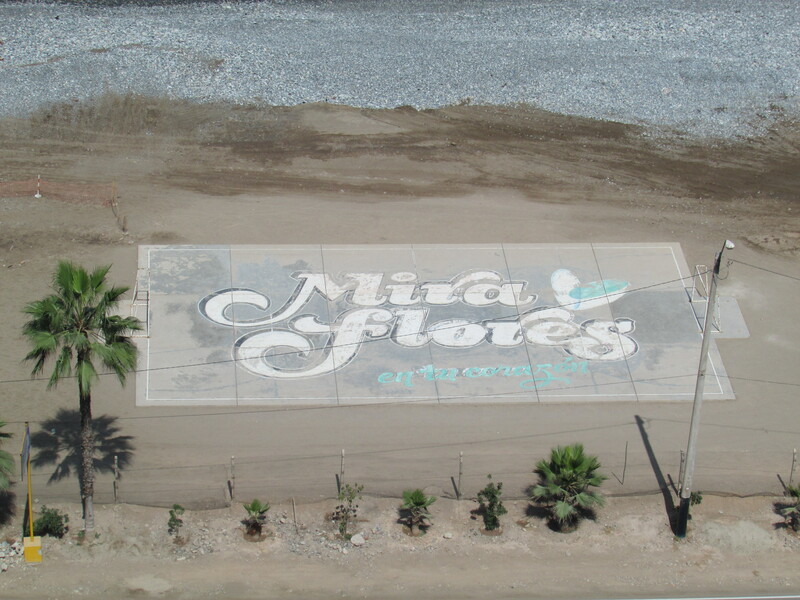 I stayed in two hostels while in Lima in the most famous area, Miraflores. Some people think Miraflores is too expat-y, but for me it was a welcomed change compared to the bit rougher Talara in the North. I avoided the tourist things and just wandered around the city for the most part, enjoying the loveliness of being in a major metropolis again. Sunday was wonderful as they shut down the streets and allow pedestrians to run, walk, or bike in the street. The days seemed to fly by and while it wasn’t the easiest place for me to be on my own (a few single meals here and there), Ricardo was quickly there to greet me. We got to have some morning drinks on the boardwalk which overlooks the ocean in Miraflores, Lima after Ricardo arrived. The views were well worth the stop. I met him at the airport. It was supposed to be a surprise but Lima traffic was horrendous. What should have been a ½ hour ride turned into nearly 2 hours. It was so great to see a familiar face and once again be with my ultimate travel partner. This was the 3rd (okay 5th if you count the two trips to El Salvador) international trip of ours. All you out there who say you have to wait until a honeymoon to go to great places with your S.O., I don’t believe you. Ricardo enjoying the coastal view in Lima, Peru! With Ricardo in tow, we set out for some famous Peruvian seafood in the form of sushi. If you know me at all, I am a massive researcher. I did my research and found Edo sushi in Miraflores. Clearly I did not research enough. I was so disappointed. I should have known considering it is a chain (sorry, I’m a bit anti-chain). It was an expensive meal for average sushi. We had two rolls and tiradito – supposed to be a bit like capriccio but was too heavy and too much like sashimi for the type of fish. Our amazing feast at Punto Azul made up for the previous night. I could eat this multiple times a week! Luckily, the next day was a much bigger success. Our plane left at 3 for Cusco. As mentioned, the airport was around a 30 min ride away so we figured as long as we left by 1 or so we’d be good. Well, as we only had another day in Lima on our return, we decided to get ceviche and one of the best places in Lima is Punto Azul and it lives up to its reputation! We made it there around 12:30, ordered almost immediately and paid before the food had even arrived. We got ceviche, stuffed oysters, and arroz con mariscos ( rice with shellfish). A buzz, completely stuffed, and the first cab we found, we booked it to the hotel for our suitcases and then off to the airport. I was sweating bullets in that cab worried we’d hit traffic and be denied boarding but we made it! Our first ceviche of Lima! So delicious, you bet it wasn’t the last. Why Lobitos should be a stop on your Peru tour. I took a bus from Mancora to Talara, Peru about three stops, or an hour and twenty minutes at around 12pm. I am confident I was the only foreigner on that bus. Talara is not nice. That is the simplest way to put it. It is a Peruvian city overrun with trash and people. It is a oil port town and many people came to the city hoping for jobs. However, the companies (owned by the Spanish) ended up bringing in people from Spain to perform technical jobs such as Engineering which the people of Talara were not trained for. This turned into a problem which results in near weekly strikes where any cars approaching Talara have rocks thrown at them. Needless to say I was glad I wasn’t staying in Talara but I was nervous for Lobitos at that point. I got off the bus and walked about two blocks to where the local collectivos were, or shared taxis. The interesting thing about these Taxi’s is you don’t move until the taxi’s are full. Then again, I cannot complain after a 20 minute ride for 3 soles or $1 USD. I figured I would be okay hanging out in Lobitos for a while. When I finally arrived to where I was staying in Lobitos, I was pretty content. It was a hotel on an old military base. It was a short walk to the beach. It was small and their was a room with a TV to watch movies. Of course, there was no market in Lobitos so you always had to plan your meals when you went to Talara. Also, internet was spotty but you could not beat the calm uncrowded beaches. So why should you visit Lobitos? 1. Beaches – These are not the best beaches in the world. These are solid beaches on Peru’s North Coast and honestly, nicer than most beaches I saw in Peru and even Colombia. I love when you have beaches to yourself. 2. Surf – If you are an intermediate to expert surfer, Lobitos is for you. It occasionally gets a bit busy but you can usually find some time for yourself during the day. As a beginner, it was a bit too much for me and I was taken out a few times. 3. Relaxing – So relaxing. No rush. No problems. No traffic. No daily grind for anyone in Lobitos. All you have is sun, surf, and drink (if you want). The only complaint was when the sun would get too hot walking back to the hotel from the beach. Things could be worse. I stayed in Lobitos for about 2 weeks. Fortunately it was a much better workaway than my previous experience. After two days in Lobitos I was a bit worried that I would be so bored. I came to really enjoy the pattern and days to focus on myself. My days usually went like this: Wake up at 7am, Run 3 miles (on the beach), jump in the ocean, dry off in the sun while reading, Nap or watch a show, Work lunch from 1-5, make dinner, watch a movie, call it a night by 10pm. Wake, and repeat. Not a bad way to start the day, not at all. I don’t think I’ve ever been less stressed in my life. Occasionally, I’d change things up by trying to surf or writing. 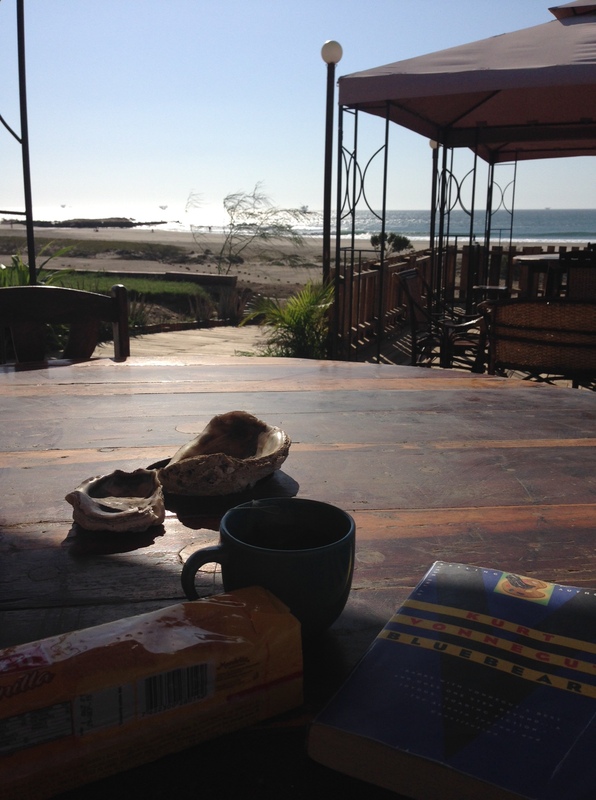 I think I read about 4 books in two weeks while out in Lobitos. It was also great to get to know people as there was a French couple, a Swedish couple, and a girl from Colorado out there with me. 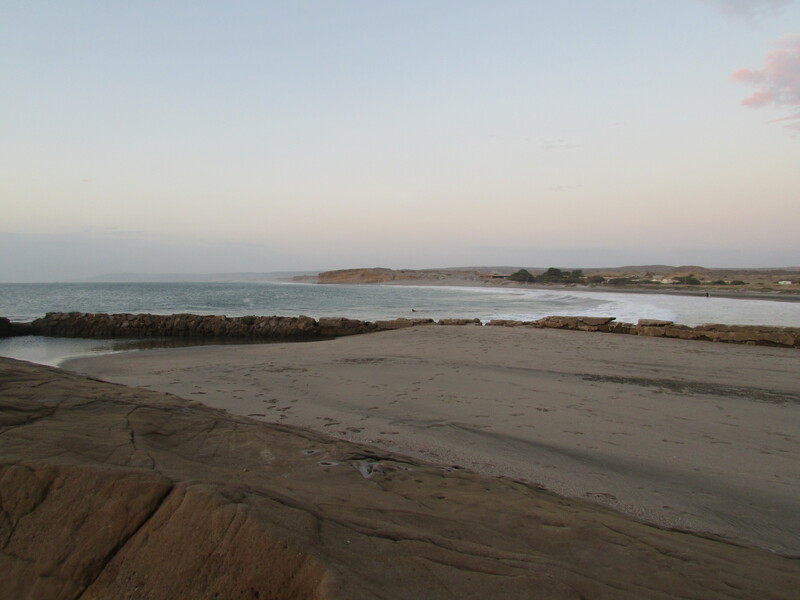 Do yourself a favor and get off the beaten path and take a few days to refresh in Lobitos, Peru. I was sad to say goodbye, and especially to these sunsets.